Waikiki Undersea Adventure Experience Hawaiian fishes, coral and turtles up close! Climb aboard Atlantis XIV, the world's largest hi-tech passenger submarine which holds a whopping 64 passengers -- that's 16 more people compared to our smaller 48-passenger submarines! Being in a submarine and descending to 100 feet underwater is an adventure in itself. You will also get to see real marine life up close. 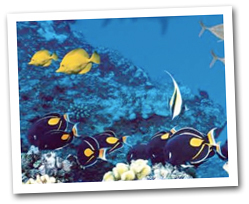 The Atlantis Waikiki dive site is home to many Hawaiian fishes, coral, and turtles. Known for its quality and safety, Atlantis is an eye-opening experience that takes you beyond the classroom as you learn about coral, reef life and submersibles while visiting our sunken shipwrecks, airplane and other artificial reefs. Atlantis has a spacious air-conditioned interior, large view ports and comfortable seating. If you haven't been to the bottom of the ocean before, this tour is a "must do!" 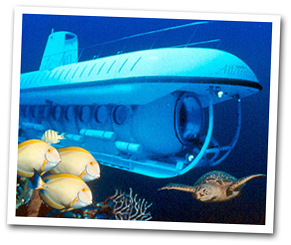 The Atlantis Premium Submarine Tour takes place aboard the world's largest hi-tech 64-passenger submarine! The large submarine offers an enhanced amount of personal space and large viewports (compared with the other Atlantis subs). 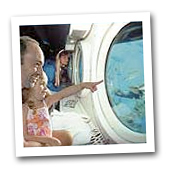 A complimentary Atlantis Souvenir Dive Log with gift shop specials is included. In addition to these special bonuses available only to Premium Tour passengers, OUR SPECTACULAR 64-PASSENGER SUBMARINE PROVIDES A MORE COMFORTABLE ENVIRONMENT COMPLETE WITH LARGER VIEW PORTS WHICH PROVIDE MORE THAN 65% GREATER VIEWING AREA COMPARED TO OUR SMALLER SUBMARINE. Additionally, passengers will find more personal space per guest and individual seating complete with seat-backs compared to the bench-style seating on our other submarines. Please note that the 10:00 AM Tour is Japanese narrated. Complimentary round-trip transportation from select Waikiki hotels. Guests must check-in at the Hilton Pier located in front of the Hilton Hawaiian Village Ali'i Tower. Check-in required 30 minutes before the scheduled submarine tour time.